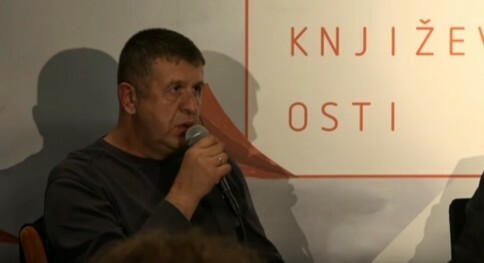 Josip Mlakić was born in Bugojnu, Bosnia and Hercegovina in 1964. He completed his degree in engineering at the University of Sarajevo. Mlakić is a prolific and multiple award-winning author who has published ten novels, three collections of short stories and a collection of poetry: Puževa kučica (1997) (The Snail’s Little House), Kad Magle Stanu (2000) (When the Fog Lifts), Odraz u Vodi (2002) (The Reflection in the Water), Obiteljska Slika (2002) (A Family Photograph), Živi i Mrtvi (2002) (The Living and the Dead), Čuvari mostova (2004) (Guardians of Bridges), Oči androida (2004) (An Android’s Eyes), Ponoćno sivo (2004) (Midnight Gray), Psi i klaunovi (2004) (Dogs and Clowns), Tragom zmijske košuljice (2007) (Following the Trail of a Snake’s Skin), Ljudi koji su sadili drveće (2010) (The Man Who Planted Trees), Mrtve ribe plivaju na leđima (2011) (Dead Fish Float on their Backs), Planet Friedman (2012), Božji gnjev (2014) (God’s Rage), Svježe obojeno (2014) (Freshly Painted), Bezdan (2016) (Chasm). His novel Živi i Mrtvi (2002) (The Living and the Dead) was turned into an award-winning film, which he wrote the screenplay for. The feelings and impressions evoked by Mlakić’s short story, Like in That Film, will stay with you, just like the image of cranes in the sky. Read it in the link below.